Black Color: Sally Hansen "Midnight in NY"
Pink Glitter Color: Sally Hansen "Rockstar Pink"
Chunky Glitter Color: Wet'n'Wild"Party of Five Glitters"
It was difficult to capture all the glitter & shine on this nail design in the pictures, but they still give you the idea. The hexagons that show up green are really a translucent blue color that has green reflects. I lost a hexagon on my thumb before taking these pics. =( I noticed that you need around 2 coats of top coat to seal these in without them peeling up or off. 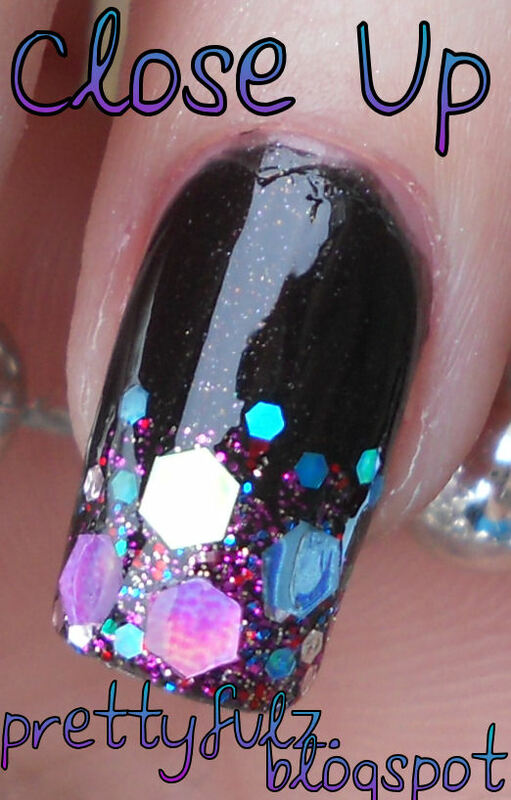 This would be a really cute nail design for New Years Eve or any celebration, with the same or different colors. This design is really easy to re-create as long as you have the patience to put the hexagons on individually, or you can use a chunky glitter polish to get a similar look in half the time. Oh this is gorgeous! I can't wait until my nails are long enough to do things like this! I just found your blog and I must say that you are a talented nail artist. Just wanna let you know that I post this photo on my blog (blog.esthersnc.com) for my reader. Thank you!